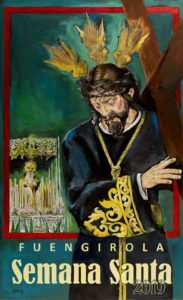 On Wednesday, the 17th of April, at 9:30 P.M. the images of Captive Jesus Christ and the Virgin of Los Dolores will be taken out from their brotherhood headquarters, located in Los Boliches in Avenida Jesús Cautivo, by the fairground, very close to our hotel. This procession will pass through the main streets in Los Boliches and will finish around 02:00 A.M. The following day, on Thursday the 18th, The Fusionada Brotherhood will take their images of Jesus Christ and the Virgin out in procession at 8:30 P.M. At that time they will leave the brotherhood headquarters located in Fuengirola town centre by Salón Varietés Theatre and will pass through some of the most important streets in town like Plaza de la Constitución and Avenida Condes de San Isidro before finishing their route at about 01:00 A.M.
That same day, also at 8:30 P.M. the Pasión Botherhood will also take their Virgin and Jesus Christ figures out in procession. They will start their route in Calle Cordoba and will pass through Avenida de Mijas, Avenida Condes de San Isidro and Plaza de la Constitucion among a few other streets. This procession will end at around 01:00 A.M.
On Friday the 19th of April, Good Friday, at 8:30 P.M., The Fusionada Brotherhood will take 2 other figures out in procession from their headquarters in Fuengirola centre and will pass through the main streets in town like Avenida Condes San Isidro, Plaza de la Constitucion and Plaza de los Reyes Catolicos, ending its route at about 01:00 A.M.
That same day the Yacente Brotherhood will take their figures out in procession, leaving their headquarters located by Bioparc Fuengirola at 8:00 P.M., and the Pasion Brotherhood will also go in procession at 8:15 starting their route in Calle Cordoba. The first procession will end at about 01:00 A.M and the second one at about 11:00 P.M.
To finish off the Week of Passion, on Sunday the 21st of April, known as Resurrection Sunday, at 11:30 the Cautivo Brotherhood which headquarters are located by the fairground, will take the image of their resurrected Christ out in procession at 11:30, passing through the main streets of Los Boliches and taking it back in its temple at around 2:30 P.M. If you have the fortune of being on holiday at Hotel Yaramar right now, we recommend you not to miss one of the most impressive Holy Week representations in Costa del Sol! Can you think of something better tan a fresh beer? Although it is an alcoholic drink drinking beer in moderation apart from calming our thirst can also have a positive impact in our health. Beer is 93% water, so it helps us stay hydratated. It is also low in sodium and high in potasium. It helps us to prevent cardiovascular diseases and it contains good cholesterol. It is high in vitamin B and contains minerals which help us to prevent bone and neurodegenerative diseases. It mitigates ageing and in the case of women it helps to reduce the symptoms of menopause. As you can see there are many good reasons to have a beer, so if you are one of those who really love having a good glass of this bubbly drink while enjoying some fresh air you will certainly like the plan we are going to suggest this week. This week, from Friday the 12th to Sunday the 14th of April, La Cala de Mijas will hold a craft beer festival. 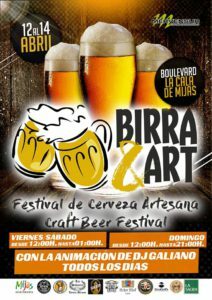 This craft beer festival is called “Birra & Art” and it will be set in the Boulevard of La Cala. On Friday and Saturday its opening times are from 12:00 P.M till 01:00 A.M and on Sunday, as it is its last day, it will be open from 12:00 P.M till 9:00 P.M. There, apart from drinking some great craft beer, you will have the chance to have fun with the entertainment as there will be a DJ playing some great music. If this weekend you are on holiday with us at Hotel Yaramar, your hotel in Fuengirola, and you fancy a good beer do not hesitate to visit La Cala de Mijas… Cheers!! This week, on the blog of Hotel Yaramar, your hotel en Fuengirola, we would like to recommend you a great free photography exhibition. This exhibition is called “Back to the same” and it contains 45 photos by famous photographer Fernando Bayona, most of them in large format. “Back to the same” is held in our local museum, Museo de la Ciudad, in the centre of Fuengirola, very close to the Town Hall and Bioparc. Fernando Bayona is a well-known artist in the photography and art scene and in his photos the backgrounds and locations are as important as the characters that appear in them. Bayona has had exhibitions in cities as important as Miami, Nueva York, Berlin or Barcelona, so it is very fortunate that we can visit one of his superb exhibitions here in Fuengirola. “Back to the same” can be visited for free until Sunday 28th of April from Monday to Friday from 5:00 to 9:00 P.M and Saturdays and Sundays from 10:00A.M. a 2:00 P.M, and from 5:00 to 9:00 P.M.
No matter if you are a professional photographer or if you just have fun taking pictures in your spare time, we recommend you not to miss one of the most fabulous and unique free exhibitions in Costa del Sol.